We did not go sailing during the weekend, but decided to spend it on the dry land instead. Well, that is almost, since on Saturday we unrolled, cleaned and inflated the dinghy for the first time this year, and I also made a short test run. In general, I would consider the dinghy as one of the must-have equipments for a cruising boat. Together with an easily deployable bow anchor, the dinghy makes wild anchorages more accessible, and we prefer staying on anchor rather than using the stern anchor and trying to get the bow fastened to the land, which is also more risky especially in an unknown anchorages. 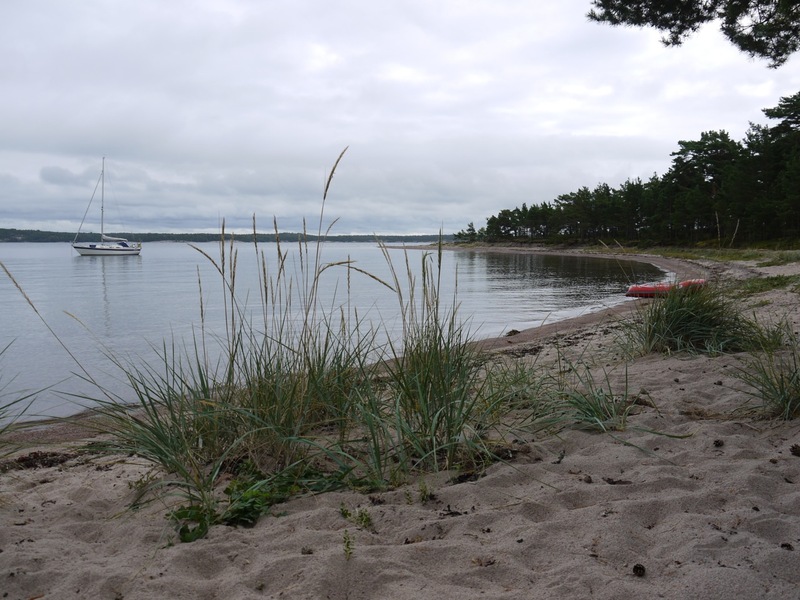 However, rowing the dinghy multiple times during the day between the boat and the land is a bit akward so we have been planning to buy an electric outboard for the dinghy. 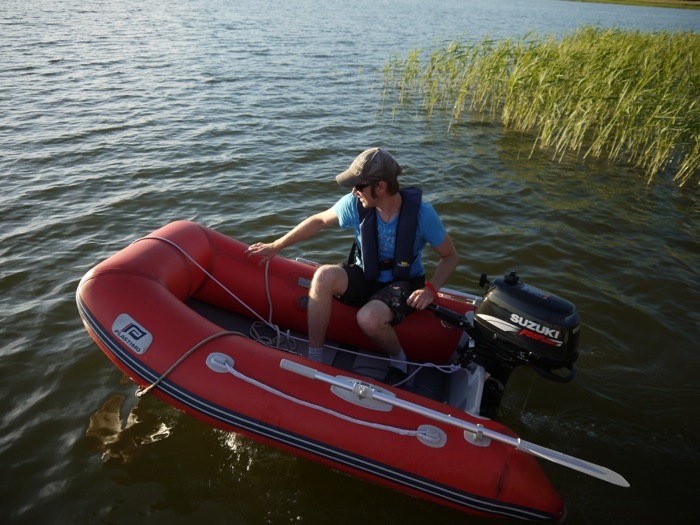 We have had our red Plastimo inflatable since 2010, but we had not actually ever tested it with an outboard engine before. Thus, on Saturday, I decided to give it a go, and try it with 6 hp Suzuki lent from Minna's father. 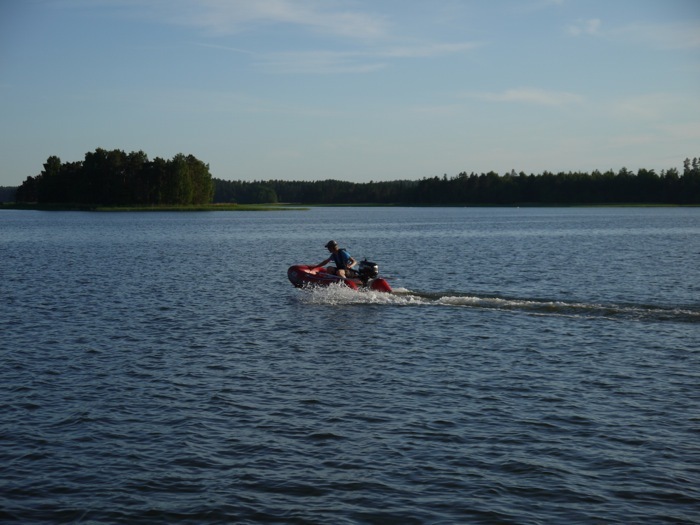 The outboard was actually a bit too powerful for the 2,2 meters long dinghy (4 hp is the maximum), so I was a bit careful in using the throttle. For the tender, we chose the Plastimo Raid P220 SH mainly because of the competitive price, light weight and compact dimensions when rolled, as the initial idea was to store it in the cockpit locker. However, it turned out to be a bit too large for the locker so it is either towed or stored on the coachroof in front of the sprayhood for longer passages. I must say, that I was a bit disappointed about how the dinghy handled under power. I have previously had a bit longer Bombard B1 (an old 80s model) inflatable, which had a hard wooden floor and, if I recall correctly, even a small V-keel. Thus the boat had a relatively good steering control, and I used to make rather long trips with my trusty Bombard. 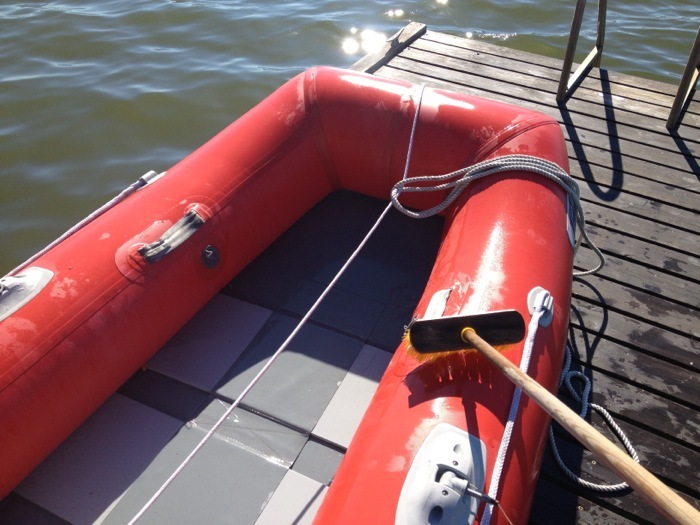 On the other hand, our current Plastimo Raid has a slatted bottom, which makes the boat in general more flexible, and the totally flat bottom affects negatively the directional stability. At low speeds the dinghy did not seem to have a steering at all - it was like steering on ice. It was also a bit difficult to get the dinghy to plane, and when it did, it felt unstable, so I did not even dare to try it with the full throttle. Furthermore, there was not that much wind and the sea was almost flat. So maybe an electric outboard or small 2 hp outboard is ok for moving this dinghy with 1-2 adults over relatively short distances, but this is not clearly an inflatable for long explorations, fast cruising or for rough anchorages. Thus, for the next dinghy, I would be looking at a dinghy, which is a bit longer and preferably comes with an inflatable 'airdeck' floor and keel for better directional stability. In general, for a small sailing boat, the choice of dinghy is always a compromise between the performance and compact size and weight, as it needs to be stored and lifted onboard frequently. 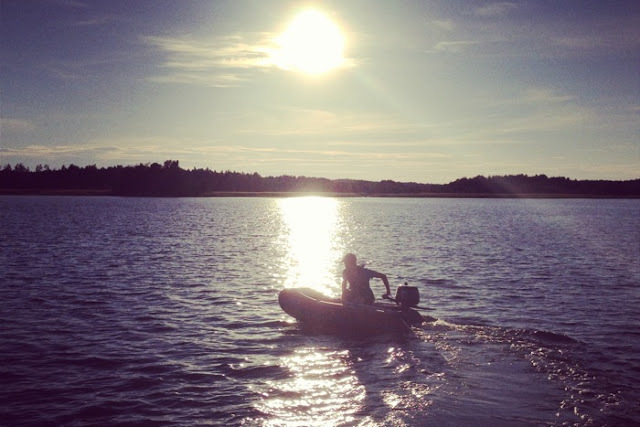 Do you have an inflatable dinghy onboard? What kind of experiences do you have about the use of inflatable dinghies while cruising? Hi Antti, I've been also looking for a dinghy. Have checked out 230 cm dinghy that's currently on sale in Motonet, but decided to take a look at the Biltema one as well. The Motonet inflatable has a wooden floor while Biltema has an air-filled one. I'm a bit concerned on the package size, though, as the locker space is pretty limited. We'll see... I wouldn't like to lash it on the deck because there really isn't a place for it. Hi Timo, if buying an inflatable now, I would definitely be checking the ones that you mentioned. Especially, as they come with the V-keel. Unfortunately they do not seem to mention the dimensions when the dinghy is rolled. In our boat, the cockpit locker opening is just too narrow to get the dinghy inside, so it is often stored on the coachroof, which naturally reduces the visibility forward quite a lot. As we are also towing the dinghy quite a lot, so two strong pad eyes on the bow was one of the main criterions. Hi, i was also looking for a dinghy for several years and tried many different sorts and tested them thourougly. But like you, I remebered as a child when I drove dinghys in the Adriatic, that Zodiac, Bombard and Achilles are the best and worth the cost depending what your nead is. Even today I have friends thats still owns these models and after 25-30 years they are still in great condision. They are more seaworthy than many other models on the market today, that includes Honwave and Yam dinghys as well. Me and my girlfriends experiences are that the best dinghy for our crusing on a realativly small sailboat ( maxi fenix), is a dinghy with an inflateble floor. Because it makes it easier to carrie and handle. If we would have a lager sailboat I would choose a RIB dinghy with a hard V- floor, permanetly fixed on the aft. We went for a Zodiac 285 fast roller (CFR) inflateble its weight is ca 35 kg and we just love it. There is anough space for 4 ppl or just me and my girlfriend with grocerys. Our engine of choice is a 2 stroke Yamaha Malta 3hp. Why? Because it is a engine that is durable, relaible and you get more horse power per weight from the 2 stroke engine. It is much easier to handle a engine on 15-16 kg and is not sensative how its positoned during transportation or mounting/dismounting. Because of the low weight is more handleble while mounting the engine on the dinghy or move it to the pushpit on the sailboat while cruising. In my opinion it is the best outboard engine manufactured for the sea ever!. We did not choose the 4 stroke engine because of its construction, maintenence, sensativity while handeling it, weight and the choice of materials in it. Our first thought was a honda 2,3 hp but it was extremly noisy! and I think the construction of the enginge is not sutible for saltwater at all!. The parts were made of common steel. We compared the construction, weight, flexability between dingys and choose Zodiac even if they are not the best there on the market. So with my experience, after many contenplations, for our needs and the size of our boat it felt that these choices were the most optimal. I contacted you on facebook a couple of years ago. Asking about your dinghy I saw on a picture :) And you repleid that you had just bought it and you had not have the chance to try it out yet. Im not sure if you remember it. Anyhow good luck with the hunt for a dinghy! P.S You mentioned an electrical engine. My thoughts is that its more complivated and more storage onboard. It would be a better choice if you only had a dinghy and your needs were only to go out fishing. Thanks "D & L" for your very informative comment on dinghies and outboards. I definitely agree with you, that those old Bombards are of great quality. I am actually a bit disappointed that I sold my trusty B1. However, it would have been too large for our current needs. In the end we did not buy that electrical outboard for this season. I think that that its biggest challenge is the problem with storage especially due to its relatively large propellor etc. Thanks for sharing experiences on Yamaha Malta outboard. That could very well be a good option for us as well, but our biggest problem at the moment is that there is not much free space on our pushpit, so I am not sure where I could mount the outboard while sailing. Also as I wrote in the blog post, our current dinghy is not very good for motoring, so we would probably have to buy new dinghy as well. Btw. how your Zodiac handles with motor, can you plane with it? -we (or me alone) can not plane with it (Yamaha Malta 3hp) we just find it verry reliable, light and easy handle (ca 16 kg including 1,5l gasoline tank/ easy to assemble / pushpit to dinghy or the other way , even much easier if you handle it from "bathing platform" at the aft of sailboat! -we use dinghy like transportation from our anchoring place to shore/beach or to store to buy some food or restaurant... Latest we used it for sightseeing ( You can drive it almost 2h on 80% of power just on fuel inside of outbord engine! -Outbord is henging on pushpit with "leg" outside of cockpit ( we was surprised how little space it takes, and thanks to engines low weight, we assabled cheapest 2 peace of plastic we could find (smallest) in local nautical store for outbod engines and it works great! Hello Timo, in case buying a good inflatable right now, I would still be checking the types that you pointed out, especially, because they come with the actual V-keel. Regrettably they do not appear to mention the actual dimensions once the dinghy is actually rolled. Within the boat, the actual cockpit locker room opening is simply too narrow to obtain the dinghy within, that naturally decreases the presence forward a lot. If you're looking at at tender which can easily fit in a locker, is very portable and easy to use then I'd recommend the 3D Tender range. We stock the full range of inflatable tenders from 3D, highly recommended and very popular with our customers.